Yesterday i have a problem when user send email to external domain example yahoo.com we got bounce error : Remote Server returned ‘<mta7.am0.yahoodns.net (98.138.112.37) #5.0.0 smtp;553 5.7.1 [BL21] Connections will not be accepted from <IP Public>, because the ip is in Spamhaus’s list. 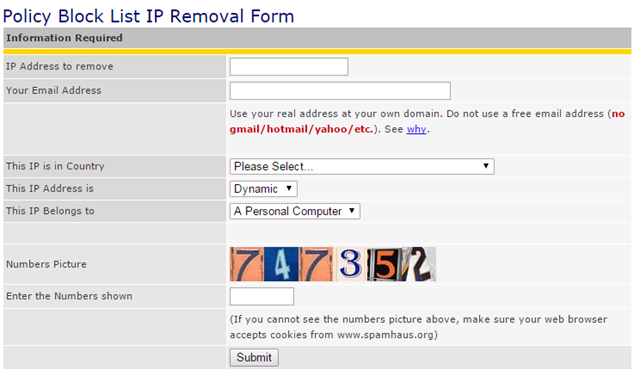 Than we check my IP public by mxtoolbox.com and i got my ip is listed blacklist by spamhaus. 3. After submit your IP address you will receive email notification code and enter code confirmation Clik Sumit.